Our venture into the world of alpacas started in 2008 with the purchase of 4 animals. Finding how enjoyable both the animals and the members of the alpaca community were solidified our commitment and passion for these animals and thus we have grown. We strive to be active members of the community, and are always trying to learn more about the animals and what they have to offer. Our animals are raised in a family environment, with everyone on the farm pitching in to help. We house roughly 40 huacaya alpacas, and our focus is on producing sound, healthy, happy animals that exhibit the full range of colours the breed has to offer. In 2008 we were introduced to a local breeder, who assisted us with the purchase of our first animals. Our first few were a motley lot, with two adult females, two yearlings, and eventually two cria who would set the foundations for our future activities. Pictured, from left to right, are Prudence, Serenity, Misty, Ellayo, Krugerrand, and Twilight. Our initial herd of animals was largely unregistered, and would remain so for the first 3 years. With the help of our friend Scott, it was not long before we had introduced new bloodlines of both CLAA and ARI registered animals to our herd. Among them was Atlas and Mescalero, who were the first animals we ever competed with in 2010, at the A.L.P.A.C.A. Odyssey. 2010 was also the year when our first cria came into this world. Misty, one of our first females, had been bred to a Rockamundo grandson, Enrico, the year before. She graced us with Eos, our lovely (and very personable) multi. Eos was not alone, however, as April, who had come to us from Scott, had also been bred, and during one of the stormier days that summer, gave us Paz. Both Paz and Eos would turn out to be lovely animals with who competed alongside the boys at shows, and who have made us quite proud as production animals. In 2012 we were fortunate enough to participate in the A.L.P.A.C.A. spring show, providing two animals for the shearing demonstration. Both Eos, and Athena, were quite popular amongst the visitors, and proved to be excellent demonstration animals. Both girls were featured in the Vancouver Sun as part of the event. We continue to be active members within the community. Our time amongst other breeders at shows, and learning about the qualities we would like to see in our animals has helped us over the years as we have added foundation members to our herd, with the help of far more experienced breeders such as Ernie and Denise Gamroth, Barry and Shirley Charters, and Bill and Jesse Chernoff. These farms provided us with some excellent males and females alike, who complemented the small herd we had already built, based on the lovely foundation animals we had purchased from Scott Sillito. This grew our herd, and has allowed us the freedom to truly start shaping out our breeding program into something more definite. The road to this point hasn't been easy, with both wins and losses along the way. However, we have been pleased to see progress within our herd as our knowledge and experience help us make decisions. With the help of experienced breeders, and the support of the alpaca community, our farm has grown into something much larger than just those initial six "pets". We're still learning and growing, and we look forward to seeing what the future brings. The CLAA is the breed association and registry in Canada, governing Canadian alpacas. 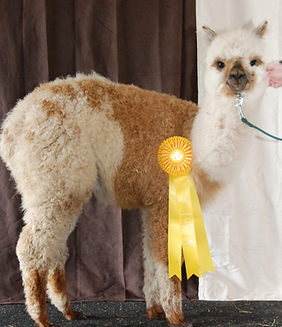 Northern Mystery Alpacas have been CLAA members since 2009. The AOA, formerly the ARI, is the American breed association and registry for alpacas. Northern Mystery Alpacas have been members of the AOA since 2009. Alpaca Canada is a division within the CLAA that is designed to act as the voice of the Canadian alpaca industry. It seeks to aid the membership within the industry, and promote the Canadian industry on an international scale. Alpaca Livestock Producers and Cooperators Association, or A.L.P.A.C.A., is a Canadian association dedicated to promoting alpacas and helping producers within the community. The CLAA herd book is the online database documenting all CLAA registered animals. You can find not only our animals within this public database, but any other CLAA registered alpacas you may be interested in. There are a variety of shows we attend when we are able. If you are interested in meeting us at a show, those shows we regularly try to attend can be found linked below.